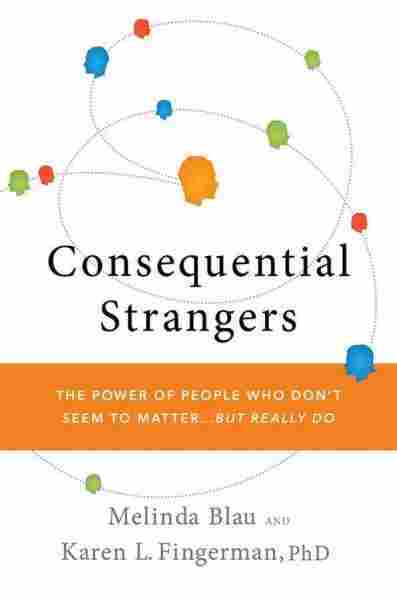 The Importance Of 'Consequential Strangers' You get your coffee from your regular barista. You give a small nod to the guy you see every day at the gym. You don't know these people, but they're vital to your social landscape. Author Melinda Blau talks with Neal Conan about her book Consequential Strangers. You get your coffee from your regular barista. You give a small nod to the guy you see every day at the gym. You don't know these people, but they're vital to your social landscape. Author Melinda Blau talks with Neal Conan about her book Consequential Strangers. When humorist Joel Stein, a regular contributor to Time magazine, read the proposed 2006 list of influential people, he decided his editors should "get out of the building more." Chinese businessman Huang Guangyu, Egyptologist Zahi Hawass, and Balenciaga designer Nicolas Ghesquiere meant nothing to him. "What about people who actually affect us?" wondered Stein in his annual sendup of the Time 100. And so, the Joel 100 was born. Who did matter? Of course his loved ones, but including Stein's wife, mother, and father, there were only eighteen of them. The rest were acquaintances, some obviously more important to him than others but probably not people he'd invite home for Thanksgiving dinner. Forty were people who, in varying degrees, furthered his career, like the producer who gave him his first job as a sitcom writer. Another fifteen or so were individuals whose services and advice the thirtysomething Stein couldn't live without: his lawyer, his agent, his CPA, his account executive at Citibank, his eye doctor, and the copy editor who "makes me look smart by fixing my mistakes." He also listed former landlords, his renter, a mortgage broker, and the couple who sold him his house and "had the guts to move in across the street" - a handy resource when he had plumbing questions. Joel Stein's "Meet the Other 100" gave me a great idea: to make a list of the people who matter most to me. I wish I had started that list a long time ago. ... I never took the trouble to tell a high school teacher or a business mentor or a beloved grandfather what a significant influence each had on my life. Stein was shocked that anyone would bother to look at "a weird online list of people in my life," no less feel inspired by it. He has a point, considering that he also included his hairstylist, the man who delivered his bottled water, and the service advisor at the Mini Cooper car dealer who showed him how to hook his iPod into his car. Another buddy made the list because "a guy who knows a lot about good ethnic restaurants is worth his weight in pupusas," and a waitress because she gave him tips on braising short ribs. And in the number 15 spot was Dora, the proprietor of Yuca's Taco Stand, who "smiles as if she knows me." Stein admitted an ulterior motive: Once she saw her name in print, perhaps Dora would also throw in an extra taco. Stein didn't anticipate that his tongue-in-cheek essay would be taken seriously, no less strike a nerve. But the Joel 100 reflected an unspoken truth: Who we really care about are the countless everyday people who touch our lives and influence us personally. The editors of Time methodically singled out particular scientists, politicians, environmentalists, and inventors who changed the world, but those people are total strangers. Readers identified with the Joel 100 because it was a roster of intimates and consequential strangers. The fact is, each of us has a unique collection of consequential strangers like those on the Joel 100 — people outside our circle of family and close friends. They range from long-standing acquaintances to people we encounter on occasion or only in certain places. They cut a wide swath across our lives, and yet each is linked to us in some way and fills a specific need. In fiction as in real life, consequential strangers are everywhere, even in the funny papers. Single Slices, drawn by political cartoonist Peter Kohlsaat, has two guys sitting at a bar, one saying to the other, "It's not quite a relationship ... it's more of a inclinationship." Some of the most memorable characters in television sitcoms emerge from supporting roles: Eldin, the beefy laid-back handyman on Murphy Brown, who doubled as a babysitter, or Rosario, the wisecracking Salvadoran housekeeper on Will & Grace. And just about everyone fits the bill on Seinfeld or The Office, and especially the gang at Cheers, the fictional tavern where "everybody knows your name." 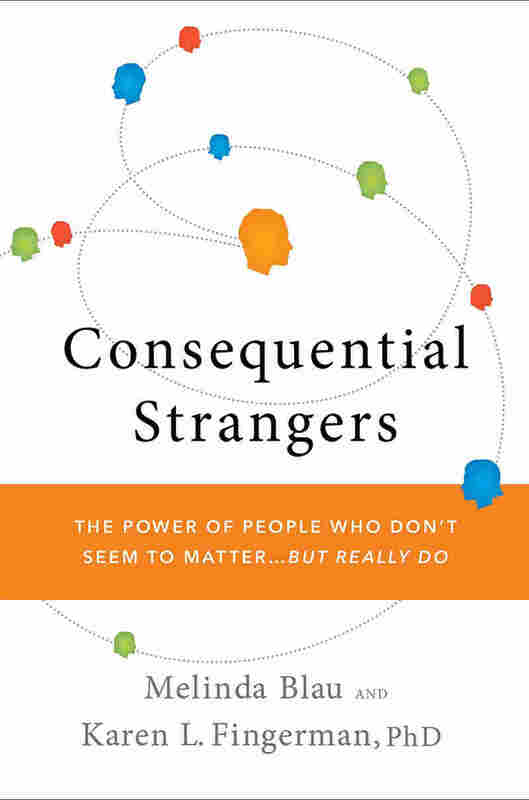 The term "consequential strangers" captures a fascinating paradox about casual relationships: They are as vital to our well-being, growth, and day-to-day existence as family and close friends. Admittedly, the word "stranger" is counterintuitive when defining people who have an impact. How can they be strangers? The point is, they are not; they are entirely different. A stranger is someone you don't know and can visually identify by "category" — a man, a waitress, a person of Asian descent. A consequential stranger is someone you also know something about and with whom you are actually "acquainted." If you think of your life as an ongoing drama, your intimates are the featured players, and consequential strangers assume supporting roles. A good narrative needs both. What would the Jimmy Stewart character in It's a Wonderful Life have done without the townspeople who came to his rescue? If — until now — you've never thought about, or appreciated, these supporting players, in part it's because many of them skirt the edges of your social consciousness. You might even take them for granted ... until you begin to jot down names for your holiday card list. Scanning your social brain, you come up with people you don't necessarily think of as "important," certainly not compared to your loved ones. But somehow it feels like a good idea to send season's greetings. One of Fingerman's studies helps explain why. She asked a group of volunteers about each holiday card they had received that season — whom each card was from, their relationship to the sender, and what getting the card meant to them. She also questioned their card-sending habits and attitudes. And to gauge their "social embeddedness" — how connected they felt to others — she had them rank statements such as, "I feel part of a group of people who share my activities and beliefs," and "No one cares for me." People at the younger end of the age continuum — under forty — tended to view their holiday greetings as a means of maintaining or building ties, while those at the other end were more likely to see them as a link to their past. But for both groups, the more cards they received, the more socially embedded they felt. And it was not merely a matter of hearing from their intimates. Of the more than 1,400 cards analyzed, over two-thirds were from people in different pockets of the respondents' lives — colleagues and teachers, service providers, acquaintances from the past, and people they hoped to get to know better. In other words, while it staves off loneliness to hear from loved ones during the holidays, an additional sense of security comes from being connected to people who help us feel like our world extends beyond the boundaries of home. If you tend to underestimate the significance of people on your holiday list at other times of the year, it also might be because practically every article and book, every therapist, and every relationship guru in the media focus almost exclusively on "primary relationships" — your partner, children, parents, and siblings. When Fingerman and a colleague analyzed six years' worth of academic papers — nearly a thousand articles in the most important psychology and sociology journals — she found that fewer than 10% of relationship studies covered nonintimate ties, such as neighbors, teachers, clergy, and church members. Given this overwhelming bias, then, why would you give a second thought to Sara in your meditation group, Frank at the dry cleaner's, or the Smiths whom you run into at the local repertory theater? But those are precisely the kinds of people who populate our lives. They usually outnumber our intimates. On Joel Stein's list of one hundred individuals who affected his life, for instance, 82% were consequential strangers. And when Nelson Fellman sat down to compile his own list, by the time he got to number 35, more than half were acquaintances who in some way affected his life, including a woman he mentored and the corporal in the army who taught him how to play chess. Clearly our loved ones matter. People who lack close relationships are susceptible to physical and emotional problems. Because intimates are critical to our survival, they are naturally valued more by our culture and, not surprisingly, have garnered the most attention. But that's not the whole story. While those closest to our heart are synonymous with home, consequential strangers anchor us in the world and give us a sense of being plugged into something larger. They also enhance and enrich our lives and offer us opportunities for novel experiences and information that is beyond the purview of our inner circles. Indeed, after all this focusing on the peaks and valleys of close relationships, we must widen the lens to acknowledge the entire social landscape. It's not just the dearth of research on peripheral ties that limits our awareness. We also lack the vocabulary, says sociologist Calvin Morrill, one of a small, growing cadre of scholars in various fields who focus on social life outside the home. Morrill points out that to characterize personal ties as either "intimate" or "nonintimate," "primary" or "secondary," doesn't capture the vast sea of connections that fall in between. "We need to move beyond this simple (and in some ways misleading) dichotomy," says Morrill, "to recognize a range of relationships that exist in between these two extremes and function in many important ways for people." In actuality, all of our social ties are part of a fluid continuum of relationships. Consequential strangers occupy the broad region between complete strangers on the far left and intimates — our strongest connections — on the far right. Just beyond friend territory are your more valued consequential strangers — your close acquaintances. They are usually people you've known longer or see more often, perhaps know more about, like your boss or your hairdresser. You depend on them or have a significant and mutual give-and-take that affects the quality of your life. Among these closer acquaintances might be people who will morph into more intimate relationships over time, becoming good friends, even lovers. In contrast, your casual relations that fall near the "stranger" end of the continuum don't occupy as important a place in your heart. It's unlikely that you feel the same way about your mailman or a waitress at your favorite deli as you do about the high school teacher who convinced you to apply for a scholarship or the neighbor who came to your rescue when you had a flood in your basement. Many of our consequential strangers are associated solely with the neighborhood or the office, the train station, a store, the bank, the library, the gym. Calvin Morrill refers to these kinds of connections as "anchored" relationships — those that develop over time and are limited to a particular place or activity. Some of them are toward the intimate end of the continuum; others simply punctuate our daily existence, reassuring us that we're not in alien territory. As human beings, we harbor an innate desire to connect to others who make us feel safe. We seek ways to feel surrounded by people who are familiar. Thus, many anchored relationships are touchstones of our daily or weekly routines. We unconsciously anticipate the presence of these people, so much so that not seeing them or encountering them in a different place can be jarring. You run into your mechanic and his family at the mall and initially experience that frustrating where-do-I-know-him-from feeling. Suddenly you recall him in grease-stained overalls at his body shop, and you remember how he came to your aid a few months earlier when your car wouldn't start. Each of the decisions we makewhere we live and work, what we buy, what we do in our spare time, how we commune with a higher power (or not) — can thrust us into a whole new cluster of consequential strangers. Say you get a dog for the first time. You suddenly notice neighbors who have dogs, too. Depending on where you live, you begin to frequent the beach, the dog park, or "the path," as it's known in Northampton. You know that most mornings at around 8:15, you'll run into the trim, longlegged runner whose yellow and black Labs tear through the forest alongside him, the three women with their three quintessentially country dogs (a Lab, a golden retriever, an English setter), and the older woman with the porkpie hat. You know the dogs' names but not the owners'. After weeks or months of passing each other almost every day, you might finally look in the dog's direction and say, "I know this is Max, but I'm embarrassed to admit I don't know your name." You introduce yourselves, perhaps walk part of the way together, but there's usually no reason to exchange emails. This relationship is of the path. Most of your conversation is about the dogs ("Did Bogey get bigger?" "I love his haircut") but occasionally you'll discuss something that's bothering you that you haven't shared with anyone else. And, to your surprise, she'll offer a suggestion you've never considered. Although most of these "dog people" will forever remain in consequential stranger territory, they can be a surprising source of solace, especially when your dog is sick or dies. Unknowing (and probably pet-less) close friends might say, "Don't worry. You'll get another one," but you can count on your dog-walk comrades to truly understand. Reprinted from Consequential Strangers by Melinda Blau and Karen L. Fingerman, PhD copyright (c) 2009 by Melinda Blau and Karen L. Fingerman. With permission of the publisher, W.W. Norton & Company, Inc.